Kickboxing is full body calorie burning workout system that uses a combinatsion of punches , kicks, twists, balance, and lots of core muscles. There are many forms of kickboxing type Martial Arts in the world and you may hear things like “Kickboxing is famous in Thailand” , this is not 100% true in reality. In Thailand they do Muay Thai, and although some may consider it a form of kickboxing, I like to keep them separated. This is also true for tae known do and other similar martial arts that exist in the world. Kickboxing is its own type of art and as with many arts there are very similar names for punches and kicks, methods of training, yet there are also many difrences in how the participants train. 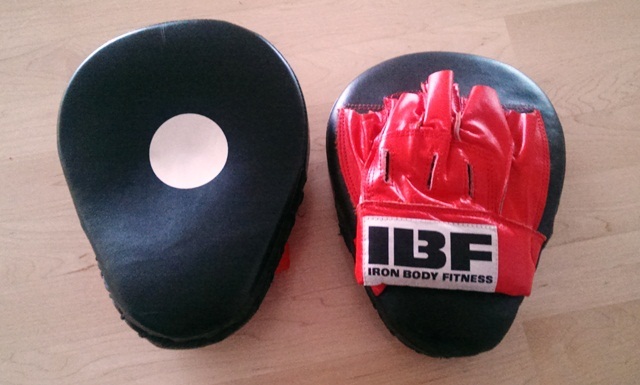 Kickboxing is a great way to get in shape all while learning some self defence moves. There has been a few times someone has told me they defended themselves using Kickboxing techniques they learned in a Fitness Kickboxing Class. For the purpose of this article we will discuss the basic moves of Kickboxing along with a brief discription on how it is performed and tips to develop the particular move. Jab - The Jab is thrown from your lead arm while in your fighting stance. If your left foot is forward and right foot is back. Then the jab would be thrown from your lead arm which in this case is your left hand. The jab is a simple manouever to perform yet often done wrong. When throwing the Jab, try to no just throw from the shoulder. This punch much like most of the other punches and kicks generates its power from the hips. When the jab is thrown, don’t just leave it out there. Quickly throw it and bring it back. Cross – This punch is usually where people throw all their energy into a single punch. It is called a Cross because it crosses your body (if your in a proper stance) when it is being thrown. Although it is generally more devistating, it is often slower and requires more control and endurance. While throwing the Cross be sure to not fall into your punches due to losing your balance and try not to have your arm doing a scooping motion as you bring your arm back. Straight forward and straight back is how it is done. Hook – To perform the hook properly takes time. You need to be able to perform a slight arm with your arm, while bringing the elbow high so it is in line with your wrist and fist. As the punch is beginning to be thrown you generate speed and power from a pivoting motion in the leg that is the same side as the arm you are punching with. So if doing a lead left hook, you will pivote off of your left foot. A good way to think of pivoting is crushing out a cigerette or squishing a bug. Same people say Elvis dance as well. Just pivot, arc arm, wrist stiraght, and elbow in line with wrist and your good. To get good at throwing hooks you need to start slow and work technique then build up momentum and confidence to throw harder. Having a partner hold pads is a great way to start. Uppercuts – No two uppercuts look the same it seems. A great devestating punch but very difficult to perform right without making yourself look like you are scooping something up from the ground or making huge broadcasted Hay makers. The key to a good Uppercut is to keep the arms in nice and tight and rototate the legs and shoulders while performing the punch and then small snap up with the arm just before you hit. To get good at at Uppercuts get a rope and tie it at both ends. Have the rope tied at your shoulder height. Then duck under the rope going side to side moving your head and body. When you get comfortable add in the uppercuts while you duck and weave side to side under the rope while moving forward. Front Kick - Front kick is under estimated because it seems abit of an amature move. However, former UFC middleweight champion Anderson Silva has knocked out a few people with this simple front kick. When done correctly it can be fast and surprising. There really is not much to discuss when this move just lift your leg and kick. When kicking in body I would advice you hit with the heel of your foot and not your toes incase you break a toe. Roundhouse Kick – The Roundhouse kick is one of my favourites. It is also called round kick, or Thai kick. What makes the move so nice is the distance away from your opponent you are able to kick at. This kick can be thrown low, medium or high. While kicking think of a baseball bat swinging at the target. Your leg should be that baseball bat. Pivote on your leg and kick with the other leg. The power is generated from the ground up and the explosion occurs from the hips while throwing the kick. It is fast and as we have seen in Muay Thai, it can be very devestating. To get good at throwing round house kicks you need to be able to generate power from your hips and rotate the body while keeping your balance. That is why this kick is believed to be an intermediate type of move. Below is a video on a very nice Roundhouse kick.